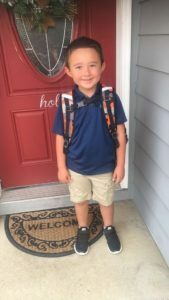 My oldest son Karson is going into first grade. Kindergarten was a year full of many learning experiences. Personally, we had various changes that added to the newness of officially entering the K-12 system. 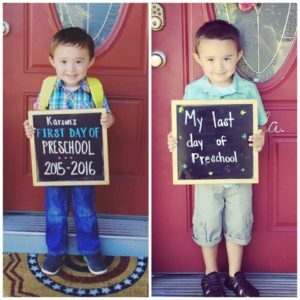 The transition into kindergarten is important. To help with the transition, I talked to Karson about his school, drove by it various times, and read books about being a kindergartener. His teacher was a sweetheart and sent a countdown calendar that added excitement. Many schools also have a kindergarten transition program that are 1-2 weeks long and half-day. Get in touch with your local school to find out information. It is also important to know that having a healthy home life plays a BIG role in school success. The simple things truly matter. Having an after school snack, time to decompress, having a well-balanced dinner and a solid bedtime routine. Throughout Karson’s early learning, I asked his pediatrician how many hours he should be sleeping and calculated naps and bedtimes. Last year, Karson started his bedtime routine at seven. Depending on your child, they may need a longer or shorter routine. –Be engaged in your child’s learning experience. Parent engagement may be done through volunteering in the classroom/school, going on field trips, continual communication with the teacher in person/email/phone. Know how your child learns, their strengths and weaknesses and provide positive encouragement. –Create healthy routines. This includes morning routines and evening routines. You know your child best and know what does and does not work. I like to get feedback from Karson about what he thinks about our routine. I also like written routines and having reminders/alarms on my phone. –Network. Get to know the other parents and other children. Depending on your child’s personality, the social piece of school may be a large influence. 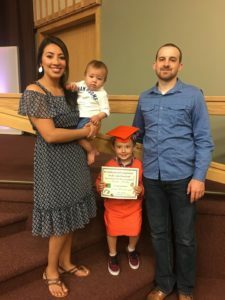 I like to connect with other parents and meet Karson’s peers. Those three tips are good for any parent regardless of your child’s age. I am thankful to have had various opportunities to connect with parents. A favorite of mine are the parent-child classes offered through LBCC. Samuel and I participated in the baby and me class. Samuel had his baby friends and I met moms. I have been able to stay in touch with them, seeing our children grow has been exciting! If you are interested in learning more about what is available, check out our September parent newsletter. Do you have any tips or tricks that work best for your family? Let us know by commenting on this post on Facebook. I hope you savor these last days of August! “See” you in a couple of weeks.